A Sneaky Spirit in the game Sneaky Spirits. Sneaky Spirits (しろいおばけ, White Ghost) are enemies from the Rhythm Heaven series. They are one of the three Smash Run enemies to represent a universe that is not been represented by a character or stage, the other three being Bacura, Pooka, and Polar Bear. 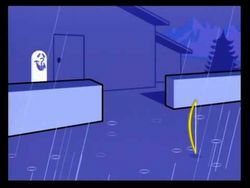 Sneaky Spirits appear in the minigame Sneaky Spirits in Rhythm Heaven and its sequels/remakes. The goal of the game is to knock the ghosts back into their house as they rhythmically pop in and out from behind a fence. Sneaky Spirits appear as enemies in Smash Run. They are rare and hard to hit, as they constantly move forward while popping in and out the ground. However, they drop star boosts, which raise every stat, when defeated. As a random event with a short duration, large groups of Sneaky Spirits can appear. Skinny white ghosts that travel with a smirk on their face. They move like they do in Rhythm Heaven, popping up and down in rhythm before trying to run away. If you manage to defeat one, you'll earn a star-shaped stat boost that improves all of your stats. Time your attacks and keep them from escaping. These white apparitions seem to have permanent smirks on their faces. Much like in the Rhythm Paradise series, they'll pop up rhythmically from a hiding place beneath the floor, then run away to a distant location. If you do manage to defeat one, you'll get a reward for your troubles, so pay attention to the rhythm and strike! This page was last edited on February 16, 2019, at 18:29.